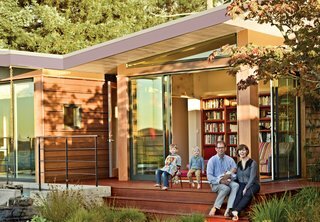 A 1950s Joseph Esherick home in Berkeley, California, inspires an addition that pays homage to the past yet is poised to host the next generation. "She was a nice, conservative lady who wanted a new house." That’s how 86-year-old San Francisco architect George Homsey—an assistant in famed Bay Area architect Joseph Esherick’s office in the early 1950s—remembers Louise Hewlett Nixon. But that description of Nixon barely flicks at the whole story behind the redwood-shingled marvel Esherick would design for her at the crest of the Berkeley Hills.